Paper can be recycled with staples, labels and stickers attached. These items are small contaminants that are removed during the recycling process. Sometimes small bits of paper cannot be recycled because they get lost in the recycling process. In general, try to recycle everything receipt-sized or larger. Find out what to do with shredded paper. Many companies have already made the transition to becoming “paperless.” Take stock of your business activities and see what could be handled or stored online instead of on paper. Learn how to go paperless. Always try to use both sides of a piece of paper for printing, copying and writing. Get a duplex printer if you want to print double-sided pages. Simplex printers are built to print on one side. In the office there can be a lot of paper waste because of reprints, bad photocopies and all of those paper memos. 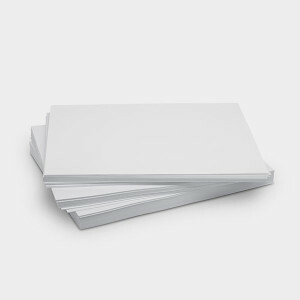 90 percent of all waste produced by the average office is paper. The average office worker produces two pounds of paper and paperboard products every day.